The force of Mr. Sloto’s Triple Twister will be greater than ever! The force of Mr. Sloto’s Triple Twister will be greater than ever the weekend’s of September when you make a deposit of as little as $35 to play with a powerful 77% Match and 77 Free Spins! Experience the mighty winds of wins once you launch the Win-Win round that will trigger the Triple Twister Feature and appears on reel 3 during normal games to substitute for all other symbols including the scattered Weather Vanes. Hunt for weekend wins with a 77% Match and 77 Triple Twister wins as soon as you make a $35 deposit! 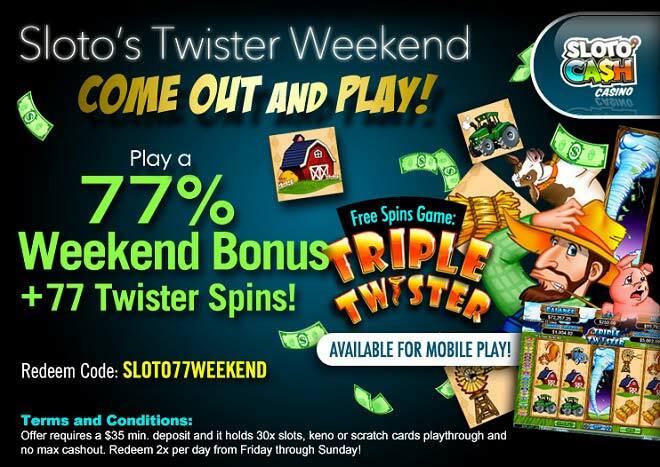 Play a 77% Weekend Bonus + 77 Twister Spins!